Cat hair can be a nightmare for home owners. Finding the best vacuum cleaner for dealing with cat hair is not an easy task at all. With so many brands and models claiming they offer the best solution, it’s hard to know which is best. We’ve discovered that the iRobot Roomba 650 Robot Vacuum is the best vacuum cleaner for cat hair. Mostly down to it’s superior suction for picking up hair and it’s ease of use. That’s not to say there aren’t other extremely good options out there that tackle cat hair just as well. Let’s review some of the best vacuums around to separate the strong from the weak, and hopefully make your decision a little easier. 9 Is It Worth Buying A Pet Specific Vacuum? 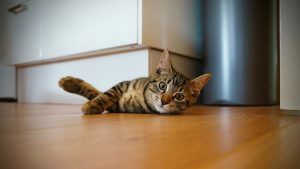 Later we’ll take a look at what characteristics make for a good cat hair vacuum, and help you discover how to improve the efficiency of your existing vacuum to deal with pet fur. Most vacuums come with attachments that turbo charge cleaning hair out of carpets and stairs. To find out how we decided on our ratings for each vacuum, let’s individually review each one to highlight it’s strong points (and weak points where relevant!). Below are the best vacuum cleaners for picking up cat hair. The iRobot Roomba is a powerful robot vacuum that makes short work of cat hair in even the tightest of spaces. It comes packaged with a self charging “home” base that it will return to when it’s finished cleaning your home. You also get an extra filter and a “virtual wall” that allows you to restrict certain areas of your home. It’s scheduling features are a dream for busy cat owners and all pet owners in general. It can be easily programmed to clean as frequently as you’d like. We found it best to set this up to run twice a week while you’re in work and you’ll always come home to a clean floor. It uses a technology called iAdapt, which scans your the surrounding room 60 times per second. This stops it from hitting walls and guides it towards any dirt that needs picking up. It has two counter-rotating brushes that work in unison to reach beyond the body of the device and pick up cat hair from the tightest of spaces. It makes easy work of adapting between different floor types and climbs onto rugs with relative ease. Regular vacuuming is key to stopping rooted in cat hairs, and preventing fleas from settling in your carpets. It won’t offer you deep cleaning, or even the same level of cleaning as an upright vacuum with a human behind it, but it is perfect for regularly sweeping up your floor without you having to do any work. Take a look at the other stellar reviews this item has received by clicking the button above. This is by far and wide the most versatile upright vacuum cleaner we’ve ever seen and it perfect for tackling cat hair. It comes with so many attachments that it’s the definitely the best choice for everyday use. It’s actually the least expensive model in it’s range but the performance increases in the more expensive models do not justify the price increase for use around the home. It performs incredibly well when you consider the low price, and it’s second to none as far as flexibility goes. Just don’t expect this to live up to the standards of the higher models in terms of design and you will not be disappointed with your purchase. The sheer amount of attachments available for these hoovers mean that with the correct fitting at hand, it’s all the hoover you’ll ever need. This hoover offers the best value for money out of any on our list, and is a remarkably cheap vacuum cleaner for taking on cat hairs. The EvoVacs DeeBot offers the best value for money for any robotic vacuum out there. It’s biggest selling points are it’s ability to be controlled via a smart phone, and it’s modest price tag. Like most affordable robot vacuums, it does without fancy features like camera navigation and super high capacity batteries, but those are sacrifices worth making. Much like the iRobot Roomba mentioned above, it can be scheduled to clean your home while our out, picking up any cat hair that’s built up throughout the day. The smartphone app is the best we’ve seen, it’s robust and offers comprehensive control over the movement and schedule of the hoover. If you’re keen to try a robot vacuum to see if the benefits are worth it, then this is best purchase you can make. 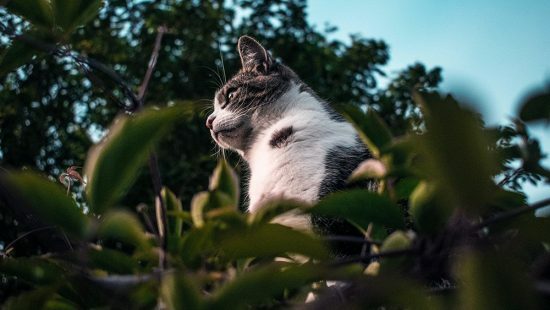 The convenience of these types is clearly unrivaled, it takes the work out of your hands and is a product we can only see increasing in popularity with cat owners over the next few years. The Shark Rocket Ultra-Light Vacuum makes our best vacuum for cat hair list for that exact reason, it’s ultra-light. It’s super easy to pick up and makes it a breeze to get cat hair off sofas, stairs and curtains. It offers incredible suction for it’s size which is perfect for getting deep rooted cat hairs out of carpets and upholstery. Unfortunately, it lacks HEPA filtration, so isn’t the best choice for those who share a home with allergy suffers, but don’t let that discourage you. The weight and ease of use makes it ideal for a quick clean without having to put too much strenuous effort in. Shorter fittings make this handheld vacuum the perfect candidate for getting cat hair off carpet stairs. It has a 2 speed brush roll setting that makes it suitable for any type of flooring. It also comes with a crevice tool, a dusting brush and a pet upholstery tool, making it the best lightweight vacuum cleaner for cat hair that money can buy. Another fantastic upright hoover that’s on the lower end of the price scale. This CleanView Vaccuum from Bissell prides itself on it’s ability to pick up anything after just one initial pass. This is best seen in action when used to pick up cat hair and other light debris. It’s easy to use but isn’t best suited for tiled floors due to the fact the brush roll can’t be lifted from the ground. Fortunately though, that same brush makes it an absolute beast at getting pet hair out of carpet floors. Surprisingly easy to maneuver and empty given the quite bulky appearance. The ease of use is very impressive. It’s as cheap as reliable pet hair vacuums get, so naturally, it’s incredible value for money. It would be a full 5 stars if it wasn’t for the unrivaled versatility of the Shark Navigator reviewed above. The Hoover Linx is the best cordless vacuum cleaner for cat hairs. It weighs in at just 7.3 pounds which is super light when compared to other upright vacuums. Features include a lithium-ion battery and a separate charger, it also has an LED status bar to keep you aware of the battery level. It has three options that suit it to all types of flooring. The handle can recline very low, that coupled with the low profile base makes it easy to get at cat hairs that are under furniture. Edge cleaning bristles will pick up dirt in those hard to reach areas that other value vacuums might miss. It seamlessly transitions between carpet and hard floor, making it a perfect budget option for those with a combination of flooring. It’s value is tough to ignore, and it’s an all round robust vacuum. Take a look at how popular it’s been with pet owners using the button above. There are a few factors to look for when you’re buying a vacuum cleaner with cat hair in mind. In our list of the best vacuums, we’ve had the following considerations in mind. These may differ from household to household, but should provide a general “buyers guide” to those looking to buy. We’ll get this out of the way early since it’s almost always the biggest influence in the decision you make. You shouldn’t opt for cheap vacuum cleaners if you’re looking for the suction required to hoover up cat hair. Set yourself a budget and try to get as much value as possible from that budget. Whether that’s by waiting for sales, or by careful consideration of your needs, the more thought you put in, the better value for money you’ll get. If you’re on a tight budget, it may be worth sacrificing some of the features you won’t really need in order to get more value for your money. As a general guideline, budget vacuums for pet hair usually come in at less than $100. The mid-range vacuums that are priced between $100 and $200 dollars are likely to be of a high quality. High end vacuum cleaners designed with cat/pet hair in mind are likely to set you back more than $200, but you do usually get a lot for your money. Not all vacuum cleaners are made the same. The best vacuum cleaners for cat hair often come with a whole host of features from filters to multi-surface brushes. If you or someone in your home suffers from allergies to cat hair, you’ll want to look for a vacuum cleaner than doesn’t irritate their allergies. The industry standard feature for combating allergies is a HEPA filter. Vacuum cleaners with a HEPA filter will absorb offending particles rather than churn them out into the air. We can’t tell you how much we love robotic vacuum cleaners. If you abide the guidelines for how often you should vacuum your house if you own pets, then you’ll know it can be a real chore at best. A robotic cleaner can be scheduled to run whenever you like, and uses sensors to make sure it gets all the dirt it possibly can. More often than not, they’re on the higher end of the price scale, but if you have the money to afford one then they are very much one of the best investments we’ve ever made. Cordless vacuum cleaners for pet hair can be very useful. They’ll make it much easier to get hair from sofas, cat beds, or even from cat trees and condos. While convenient, a handheld vacuum cleaner that’ll provide enough power to reliably pick up cat hair may set you back a pretty penny. This is definitely a feature you want to consider doing without if the budget is a concern. If you opt for a standing vacuum and want to be sure you get good value for money, then you should make sure they come with the necessary attachments. You might even find that you can buy these attachments for your existing vacuum and turn it into a cat hair destroyer! Many (but not all) of the best vacuums will come with an upholstery tool that allows you to safely hoover your furniture. Coupled with a crevice tool for hard to reach areas, you can relax knowing you have everything you need to rid your home of cat hair! Turbo tools are often marketed as the must have vacuum accessory for pet owners, and rightly so. They are capable of uprooting even the most stubborn of pet hairs and are perfect for owners with multiple cats. It also works well on curtains and bed covers. The Pet Contour Tool is probably the most underrated tool out there for hoovers. It’s an absolute gem for cleaning up stairs and hard to reach places. While most standing hoovers won’t come with a contour tool, you can purchase them with adapters that allow them to be used with any standard vacuum cleaners. Is It Worth Buying A Pet Specific Vacuum? There’s some discussion about whether or not the term “pet specific” hold any relevance to what vacuum cleaner is best for cleaning up cat hair. When you think about, what defines a pet specific vacuum? It’s really just a vacuum cleaner that has features suited to picking up pet hair. We’ve already discussed the possibility of purchasing attachments separately, so don’t read too much into the pet specific label that most brands seem to throw around quite loosely. Any cleaner that ticks all of the boxes above is going to be your best at beating cat hair in the home. Every type of vacuum cleaner has it’s uses. Some are more convenient, while others are all-rounders and provide adequate suction in a variety of different areas around the house. Handheld models are easy to use, and are best for removing pet hair from sofas and other upholstery. If you have an indoor cat who spends a lot of time on furniture, a handheld vacuum is probably a more of a necessity than a luxury. While small, there are some powerful handheld options out there that can tackle pet hair with little trouble. Not to be underestimated! The classic standing hoover is the most common choice for most buyers. They usually offer superior suction power to any other type, and can uproot hairs from carpet flooring with ease. By choosing a standing vacuum with a rotating head and a suitable brush head, you can make short work of hoovering up cat hair. Cordless vacuums are best for those with large homes, or those who prefer to clean in short regular bursts. Most are very small and lightweight and allow you to reach places a traditional standing vacuum would struggle with. These days, cordless vacuum cleaners are commonplace and are a perfectly acceptable option for pet owners looking to tackle cat hair. We can’t get over how amazing robot vacuums are. Coming home to a clean floor after a robot cleaner has been hoovering up all that dirt and cat hair is one of the best feelings and makes it well worth the purchase. They also double as cat toys, because our cats will follow this around the house without ever getting bored. For pet owners, they do lack the ability to reach awkward places, but they more than make up for that in convenience. Most robot vacuum cleaners can even be controlled from your phone, so you can prepare the house for guests at short notice. They can adapt to all types of flooring making them ideal to keep in mind as we move on to our next consideration. Does the vacuum you’re interested in cater for all of the floor types in your home? If you have a carpeted lounge and a tiled or wood floor kitchen, then you may be best opting for a robot cleaner than can seamlessly adapt between them. Failing that, you should look for a hoover that accommodates different types of flooring. If possible, look for vacuum cleaners with the best selection of attachments that make them as versatile as possible. The general rule amongst pet owners it that you should vacuum and area once a week for each person or pet occupying that space. If you only have the one pet, then once a week is usually sufficient. Any more than that, then you should be hoovering multiple times a week to stay on top of cat hair and ensure you don’t give fleas a chance to settle in your carpets. 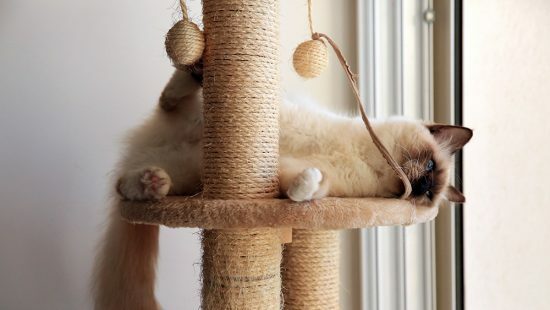 A cat tree built with large cats in mind will have sturdy posts and a solid base. We've done the work of finding the best around and highlighting which gives the most bang for your buck.